Hi there , so i have a couple of questions about vgm reverse engineering. First of all is there a tool to export every channel of vgm/vgz track to audio stems , other than rymcast. RYMcast works for the most part , but there are still some issues. For example when i convert vgm to midi (using vgm2midi tool) and export stems using rymcast. for some reason they dont line up well in my DAW. Is there any other Vgm to midi tools and vgm to Audio stems? 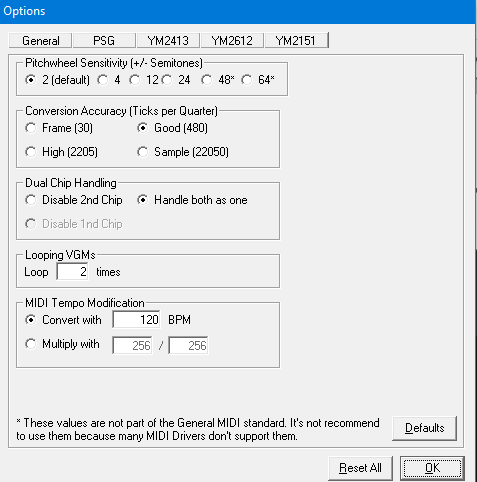 I only found Vgm2midi and RYMcast that do the job, but the syncing part is not good. For some reason i cant post url's , so thats the only way to show you guys what i mean. So essentially what i wanna do here , is to lineup midi and audio wav export files. For some reason if i play them simultaneously they dont sync up ,in the begining it sounds kinda close and fine but after a while it sounds out of sync. For audio conversion, why just not use VGMPlay? You can individually mute the audio channels in the config file and enable write to .wav only. Besides, why not just cut up the audio / delay manually? regarding Vgmplay , i agree thats a valid option too. But personally think rymcast is a really handy tool. Relating sync issue , i found out that the problem is not because of a silence in the begining of a wav exports , even if i manually correct it , eventually it will go out of sync . 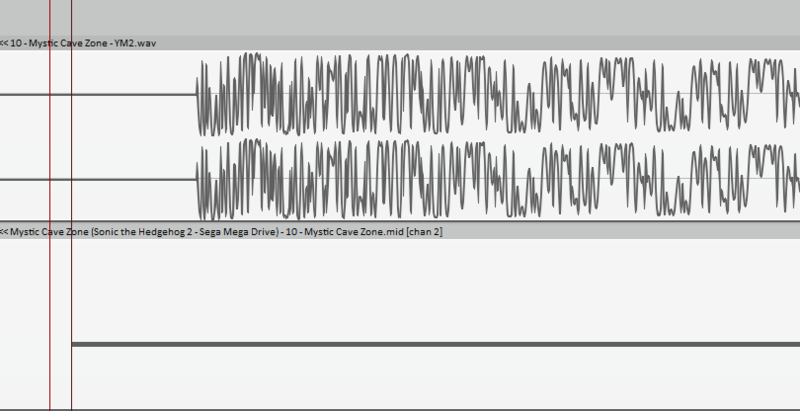 I just did a quick check and compared the MIDI (from vgm2mid) with a WAV log from VGMPlay. In the WAV log made with VGMPlay, the same tone begins at sample 2427276, which is at 55.0403 seconds. So I think that vgm2mid's timing is pretty accurate here. I intentionally did NOT use the YM2612 channels for comparison, because 1. FM envelopes take some time to be visible and 2. DAC conversion isn't very good either. But for PSG channels it is easy: All commands have an instant effect. Maybe RYMCast's export isn't accurate and that's the reasons it desyncs compared to the MIDI? Is there a quick and easy way to export each channel to wav from a vgm file using VGMplay. I know i can change ini one by one and drag and drop a vgm file on a VGMplay .exe. But its kinda tedious if i wanna log each channel and chip. I am sure there is something that could automate the process and even rename each wav coresponding to its channel and chip. I'm afraid there is no "easy" way to do this just with VGMPlay. There are no commandline options to control channel muting right now. You might be able to automate parts of the process with .bat or .sh scripts though. Maybe a decent alternative would be to using kode54's Multidumper.